Do you like a cool tie-dye in deep-sea blue? This fleecy fellow is swimming in it. 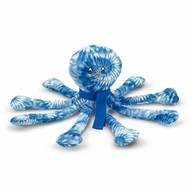 Ocho Octopus plush toy has super-soft microfleece all the way to the tips of his eight tentacles, a handsome navy scarf and the sweetest of smiles on his pillow-soft body. And like all Melissa and Doug Beeposh toys, this sea animal has style galore.